Heilongjiang Province, the most northwesterly part of China, when viewed on a map has the shape of a swan. Its capital city is Harbin, which is located south of Heilongjiang. Not only for its special position, but also as the center of Heilongjiang’s political, economic, educational and cultural life, Harbin is described as the pearl beneath the swan’s neck. Lying on the east of the Songnen Plain, what is more, Harbin plays a vital role in communications between South and North Asia as well the regions of Europe and the Pacific Ocean. Harbin was the birthplace of Jin (1115-1234) and Qing (1644-1911) Dynasties, the latter of which had a very considerable influence on modern Chinese history. At the end of the 19th century, Russia built the terminus of the Middle East Railway here. Later, more than 160,000 foreigners from 33 countries migrated to Harbin, promoting the development of a capitalist economy in the city. The economy and culture of Harbin achieved unprecedented prosperity at that time and the city gradually grew into a famous international commercial port. Assimilating external culture, Harbin created its unique and exotic cityscape. The majestic St. Sofia Orthodox Church and Zhongyang Dajie each built in a European style have the effect of bringing you into an ’eastern Moscow’. Even though you are sure to be attracted by various exotic buildings, the Dragon Tower which embodies the wisdom of the Chinese people is a must on your journey. Besides these rich cultural heritages, Harbin is favored with beautiful natural scenery. 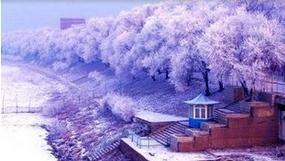 Based on meandering Songhua River and subject to severe low temperatures in winter, Harbin boasts a unique ice and snow culture. So, Harbin is also called the ’Ice City’. Each winter fantastic sculptures created from snow and ice, ice lanterns and exciting sporting events attract thousands of visitors from home and abroad. The cool summers make Harbin highly popular as a natural summer resort. It is widely accepted that the Sun Island Scenic Resort is the best choice during a sweltering summer.